BACK ON THE MARKET. 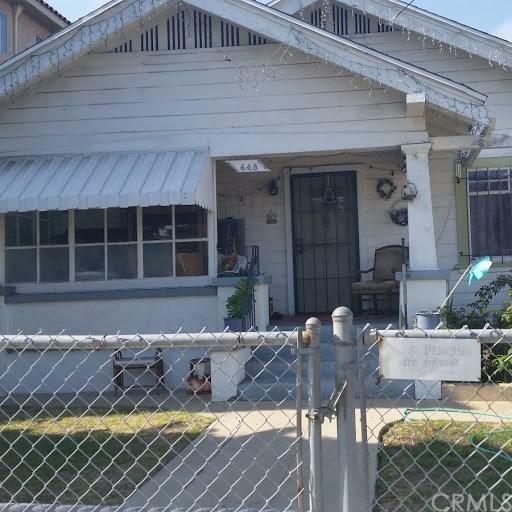 GREAT OPPORTUNITY FOR OWNER/INVESTOR!THREE BEDROOM,1.5 BATH FAMILY HOME PLUS 2- 1 BDRM UNITS OVER 3 GARAGES IN THE BACK. ADDITIONAL UTILITY ROOMS FOR LAUNDRY/STORAGE (2), PLUS SMALL BASEMENT AT FRONT HOUSE.LARGE LOT, LONG DRIVEWAY FOR ADDITIONAL PARKING. ADDITIONAL YARD/PATIO AREA BEHIND THE UNITS.NEW OWNER CAN SET RENT ON ONE BDRM UNITS.WALKING DISTANCE TO SCHOOLS AND SHOPPING. CONVENIENT TO PUBLIC TRANSIT AND ACCESS TO THE 110 FWY/VINCENT THOMAS BRIDGE.SUBJECT TO CANCELLATION OF CURRENT ESCROW. Sold by Francesco Funiciello of West Shores Realty, Inc..